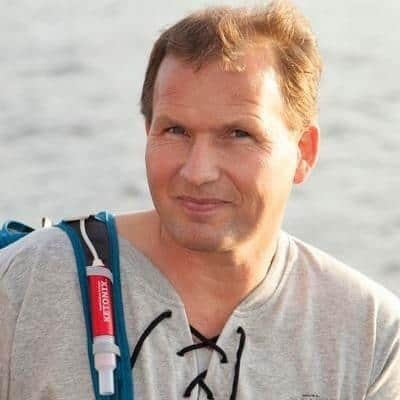 In today’s interview I get to speak with the inventor of the Ketonix device, Michel Lundell about the benefits of using a breath ketone meter to measure ketosis levels vs using blood/urine tests. Michel is very passionate about the benefits of using ketones vs glucose as a primary fuel source. He was diagnosed with epilepsy as an adult after suffering his first seizures only later in life. With a background as a software engineer, Michel looked at many solutions to help treat his epileptic seizures and avoid the need to be on anti-seizure medications for the rest of his life. Michel shares his personal health story which has resulted in him inventing the Ketonix breath ketone analyzer. He also shares some great advise on how to use the Ketonix properly and how breath acetone measurements compare to blood beta-hydroxybutrate, urine ketone bodies levels and even blood glucose levels. If you know someone who is an epileptic adult they will enjoy this episode plus people who own or want to buy a Ketonix. I also discuss with Michel an interesting case study of a women who used a Ketonix to help her beat her brain cancer and still be alive today. Special thanks to Michel for joining me on the show. Enjoy the episode! Go to https://www.ketonix.com to find out more & official support answers, like their Facebook page & follow Ketonix on Instagram. [0:20] – Introducing Michel Lundell, founder of KETONIX . [1:26] – Michel explains why he developed the blue and red Ketonix device. His epilepsy diagnosis and how prescription drugs changed him and how that led to his discovering the ketogenic diet. [5:46] – Michel has adult onset epilepsy. Emma Williams from Matthew’s Friends also talked about ketogenic diet for management of epilepsy and how it’s not common treatment for adults. [7:14] – Since 2013, Michel has been managing his epilepsy without medication. [8:50] – There is no correlation between beta-hydroxybutyrate from the blood test and the acetone from breath test, but what is the correlation between acetone and glucose? Michel explains more about this. The big difference between the beta-hydroxybutyrate and acetone is that the former is the excess of acetoacetate which is used for energy. [10:57] – Michel mentions a study by Robert Miller that shows how high beta-hydroxybutyrate and low breath acetone numbers may indicate issues with NAD+. How after you are more fat-adapted there is not as much need for ketones; muscles will use fat directly and not everything will be converted to ketones. You then have to trick the body to get high ketones. [13:19] – When looking at a beta-hydroxybutyrate (blood test), do higher numbers always mean better? Why Michel does not think nutritional ketosis is measurable in blood. How you could be low ketosis and over time build up a high level of beta-hydroxybutyrate if you don’t use it or be in high ketosis and build it up in a shorter amount of time. [15:26] – Measuring beta-hydroxybutyrate levels doesn’t necessarily give us a good idea of whether we are in ketosis. Beta-hydroxybutyrate is a build up of excess ketones. Acetone is coming from acetoacetate; if acetoacetate is not used for energy it gets stored as beta-hydroxybutyrate. Michel explains that this is why some studies will show a correlation. [17:55] – Ketone researcher Dr Brianna Stubbs explained the point about raising ketones by taking exogenous ketones in her interview. It doesn’t increase fat burning but it might give people more energy to go to the gym. [18:57] – Discussing using exogenous ketones to help manage epilepsy. It could be one way to give your brain alternative fuel, but there are more benefits to producing your own ketones. Michel believes the sugar and insulin are damaging to the brain. [20:10] – Using acetone to manage glucose levels. Michel shared some graphs showing that when acetone levels rose, glucose dropped correspondingly. How levels of ketosis achieved by fasting depends on your liver’s levels of glycogen stores. [22:36] – For people looking to manage glucose levels rather than using blood ketones levels, the Ketonix device measuring acetone could be a better way to know your body is converting. [23:40] – Michel gives us some guidelines around the best ways to measure our ketones. How measuring multiple times a day helps him understand how his body operates. The device is intended to help you figure out what works best for you– we all have different needs. [27:28] – How taking a ketone salts supplement, intended to raise beta-hydroxybutyrate, resulted in a breath acetone drop and a glucose rise for Michel. When speaking to Peter Defte and others the consensus was that because this is a high energy drink, by putting a lot of end products in your system your body does not need to create more. [30:56] – Why do we use blood ketones? Because it’s simple for doctors. Taking a proper measure with a breathalyser requires some technique. Michel explains how the highest concentrations are at the bottom of the lungs and why people fail when taking measurements. What does good technique involve? [32:45] – Some techniques around using the breathalyser to get the most accurate readings. Don’t start with too much air in your lungs, before you breathe in exhale as long as you possibly can. [34:42] – The current version of the device has software linked to it that can graph the measurements taken to an online account or to an app on your device using Bluetooth. Michel demonstrates the device and explains more about what the numbers mean. [37:38] – The older version of the device had the colour change and the flicker indicators for acetone measurement, but the newer meter shows ppm (parts per million). 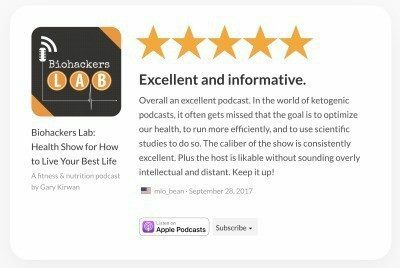 [38:20] – Michel is not always in nutritional ketosis, he talks about how he experiments a lot with different vegetables, protein, amounts of wine and brands of wine to get a sense of how his body works and responds to different things. We don’t all respond in the same way and using the devices is a great way see the effects of what you are eating and adjust accordingly. Why it’s more effective to take multiple measurements throughout the day. [43:15] – Talking about MCT oils, Michel found them more effective in the beginning but as his body adapted and changed it became less so. That’s why repeatedly testing is important, the body adjusts and results could change over time. Also talking about coffee, what works better cream or butter in coffee? [45:36] – Michel used to eat a very high fat diet. Now he is trying to reduce his fat intake until he reaches an optimal level. [46:32] – What about intermittent fasting? Michel discusses the social issue around fasting for health and wanting to be a good role model for healthy eating to his kids. He tends to limit fasting protocol to eating once a day with his kids. Generally, though, when his ketones are high and sugar is low he feels better. [48:30] – How does protein gluconeogenesis affect ketosis? Michel explains how this seems to be dependent on your lifestyle and individual energy status. If you have enough then some may be stored, but if you are exercising a lot, it’s less of an issue. Different individuals will respond differently so it’s important to measure your own response. [50:08] – Can children use the Ketonix? It is workable for children three years and over, for children younger than that it could be difficult to explain how to use correctly. Michel is developing a prototype for small kids and dogs. He has even had a request for a device which could be used for cows! [51:57] – Alison Gannett’s positive cancer story and how using the Ketonix device proved invaluable to her after taking up the ketogenic diet to help with her survive brain cancer. By taking her acetone measurements, she found coconut oil actually raised her glucose levels. The positive effects of this diet for people suffering from life-threatening diseases. [56:49] – The biggest takeaway is the relationship between glucose and acetone and that glucose and beta-hydroxybutyrate don’t correlate perfectly together. Levels of beta-hydorxybutyrate could be misleading. [57:22] – Best way to get a Ketonix device; there is an international shop on the Ketonix website.